The Vernier CO2 Gas Sensor measures gaseous carbon dioxide levels by monitoring the amount of infrared radiation absorbed by carbon dioxide molecules. The CO2 Gas Sensor may require a compatible interface and software. Choose a platform below to see compatible interface and software options. The CO2 Gas Sensor is fully supported with LabQuest 2 (version 2.8.5), a standalone data logger with built-in graphing and analysis software. The following includes additional important information about the CO2 Gas Sensor. Allow the CO2 Gas Sensor to warm up for about 90 seconds before collecting data. During warmup, the readings will be very low. The CO2 Gas Sensor is sensitive to high humidity. Do not use it in a condensing environment. Most experiments will use the Low range (0–10,000 ppm). The High range would be appropriate when measuring human respiration as expired air is typically 40,000–60,000 ppm CO2. The CO2 Gas Sensor is somewhat sensitive to temperature changes. In most cases, variations in CO2 readings due to temperature changes are small (<100 ppm on Low range, <1000 ppm on High range). The sensor is designed to operate between 20 and 30°C. It can be used outside of this temperature range; however, the readings will be less accurate, even if you calibrate the sensor at the lower or higher temperature. With good experimental design, the variation in CO2 readings due to a temperature change will be negligible compared to the overall change in CO2 concentration. If an entire experiment is to be conducted at a constant temperature, you could improve the accuracy of the readings by calibrating the sensor at that temperature. This does not prohibit taking readings using incubation temperatures or outdoor readings at temperatures warmer or colder than the 20 to 30°C range. Allow enough time for your CO2 Gas Sensor to stabilize at the desired operating temperatures. The CO2 Gas Sensor refreshes its reading every second, but typical changes in experiments are so gradual that the recommended sampling rate is 4 seconds per sample or slower. Gas must diffuse through the holes in the sensor tube before the sensor detects any changes in concentration. Because diffusion of gases is a slow process, there can be delays in the readings. To collect data in a controlled environment, it is recommended that you use the 250 mL gas sampling bottle that is included with your sensor. To collect data simultaneously with the CO2 Gas Sensor and O2 Gas Sensor, it is recommended that you purchase either the BioChamber 250 (250 mL capacity) or the BioChamber 2000 (2 L capacity). Each BioChamber has a second opening with a grommet so that you can insert two probes at once. Best results are obtained when only one CO2 Gas Sensor is connected to an interface at a time. The current draw from two or more CO2 Gas Sensors connected to the same interface can cause erroneous data. 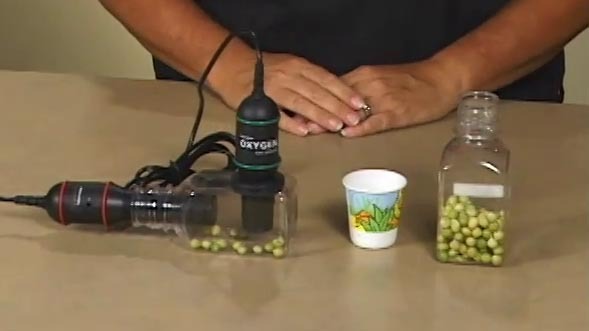 See how to use a CO2 and O2 Gas Sensor to measure the concentrations of gas during cell respiration of peas. This lab is suitable for AP biology as well as general biology. 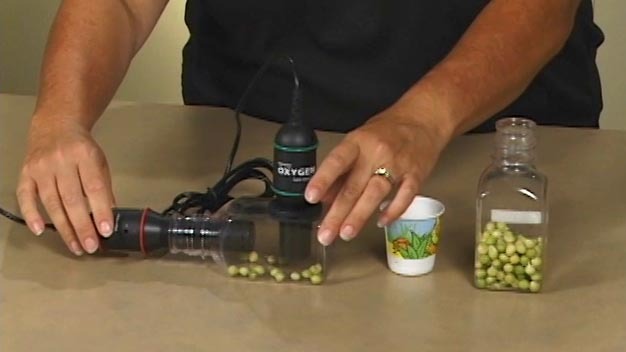 Fill the gas sampling bottle (included with the sensor) to the brim with water, take it outside, and dump the water to ensure it is filled with fresh air. While still outdoors, insert the sensor into the gas sampling bottle containing fresh outside air. You can now take the bottle and sensor to the location where the calibration is to be done. Connect the CO2 Gas Sensor to the data-collection interface. Start the data‑collection software and identify your interface, if necessary. Let the sensor warm up for at least 90 seconds. When the CO2 Gas Sensor has warmed up (readings should have stabilized), use a paper clip to press down the calibration button. Release the button as soon as the red light starts to blink. After about 30 seconds, the reading should stabilize at a value of approximately 400 ppm (±100 ppm). If the reading is significantly lower or higher than 400 ppm, simply press the button again to repeat the process. Note: If the red light stays on solid, you have held the button too long. In this case, wait for it to go off and press it again, releasing as soon as it begins to flash. Very important: Do not allow any liquids to come in contact with the CO2 Gas Sensor. The sensor is intended only for measuring gaseous, not aqueous, CO2 concentration. Temperatures greater than 65°C will damage the sensor. It is recommended that you wash the gas sampling bottles by hand. Most dishwashers will melt the plastic. The Vernier CO2 Gas Sensor measures gaseous carbon dioxide levels in the range of 0 to 10,000 ppm (Low range setting) or 0 to 100,000 ppm (High range setting) by monitoring the amount of infrared radiation absorbed by carbon dioxide molecules. Carbon dioxide gas moves in and out of the sensor tube by diffusion through the twenty vent holes in the sensor tube. The sensor uses a small incandescent light bulb to generate infrared radiation (IR). The IR source is located at one end of the sensor’s shaft. At the other end of the shaft is an infrared sensor that measures how much radiation gets through the sample without being absorbed by the carbon dioxide molecules. The detector measures infrared radiation in the narrow band centered at 4260 nm. The greater the concentration of the absorbing gas in the sampling tube, the less radiation will make it from the source through the sensor tube to the IR detector. The detector produces a voltage that is converted to ppm (parts per million) by the software. If the reported CO2 gas concentration appears to be incorrect (after the 90 second warm up), calibrate the sensor as described in the Calibration section. Keep in mind that indoor CO2 gas concentration can vary a great deal and that there will be unit to unit variability of up to a few hundred parts per million CO2. If the sensor is reading at or near the maximum value for the set range, the CO2 concentration may be exceeding the maximum value for the setting. Place the sensor back into outside air or ambient room air and wait for the readings to decrease. If there is no change in CO2 gas concentration during an experiment when one is expected, it may be your experiment and not the sensor. Test the sensor by removing it from the reaction chamber and gently blowing on the shaft to see if it responds to your exhalation. 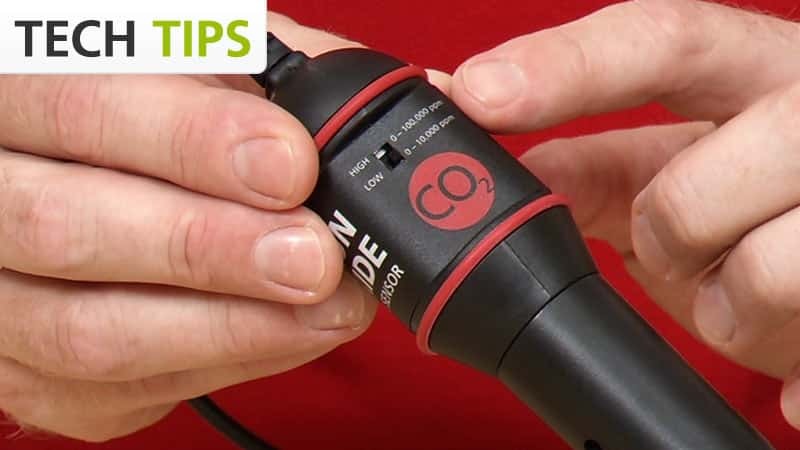 If you have watched the related product video(s), followed the troubleshooting steps, and are still having trouble with your CO2 Gas Sensor, contact Vernier Technical Support at support@vernier.com or call 888-837-6437. Support specialists will work with you to determine if the unit needs to be sent in for repair. At that time, a Return Merchandise Authorization (RMA) number will be issued and instructions will be communicated on how to return the unit for repair.